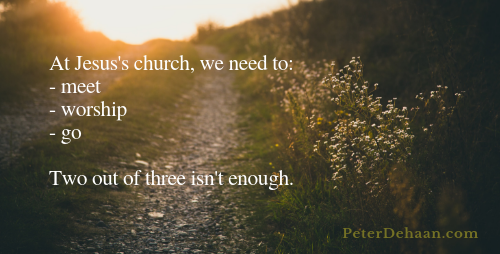 How can we go and be witnesses for Jesus when we sequester ourselves on Sunday mornings? Just before Jesus leaves this world to return to heaven, he instructs his followers to go into the world and make disciples (Matthew 28:19). In an expanded version of this incident, Jesus tells his followers to wait for Holy Spirit power and then be his witnesses, both near and far (Acts 1:4-9). The church of Jesus doesn’t do a good job of being witnesses and making disciples. To do so requires an outward perspective, yet most all churches have an inward focus: they care for their own to the peril of outsiders, with many churches excelling in doing so. Yes, God values community and wants us to meet together (Hebrews 10:25). And the Bible is packed with commands and examples of worshipping God, with Jesus noting that “true worshipers” will worship God in the Spirit and in truth (John 4:23-24). Yes there is a time to come together and a time to worship, but there is also a time to go. And we need to give more attention to the going part. I know of two churches that have sent their congregations out into their community on Sunday mornings, foregoing the church service in order to be a church that serves. One church did it a few times and stopped after they saw little results and received much grumbling. The other church regularly plans this a few times each year and garners a positive influence on their community. Shouldn’t every church make a positive impact on their community? Yet so few do. They are too busy meeting together and worshiping. In terms of witnessing and making disciples, what would Jesus think of your church’s activities? What should you do to go into your community?